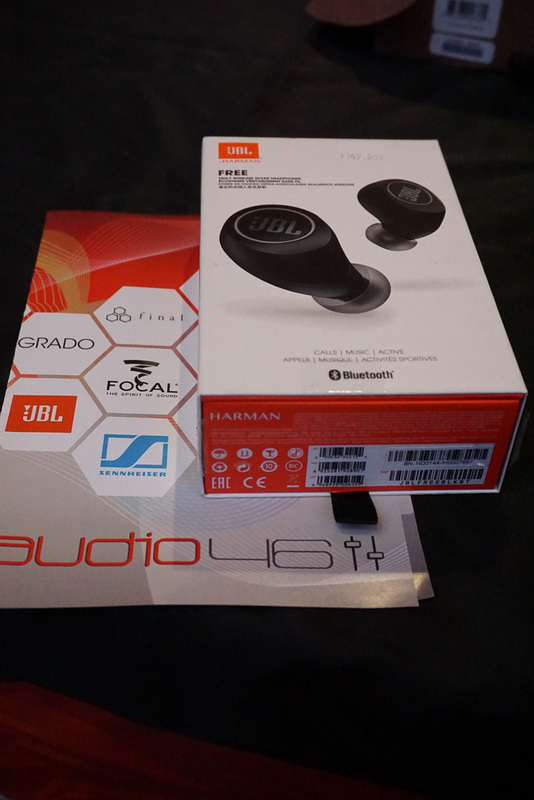 JBL exhibited a brace of new headphones and earphones, most targeting the keenly contested sub-$200 market segment. Among these models were the JBL Free Wireless earphones ($149.95) with Bluetooth electronics embedded within the earpiece housings them selves, the JBL/Under Armour Sport Wireless Flex earphones with neckband-style BT module/amplifier ($129.95), the JBL Reflect Fit wireless earphones with neckband-style BT module/amplifier and built-in heart rate monitoring capabilities ($149.95), and JBL T450 BT children’s Bluetooth headphones ($59.95). 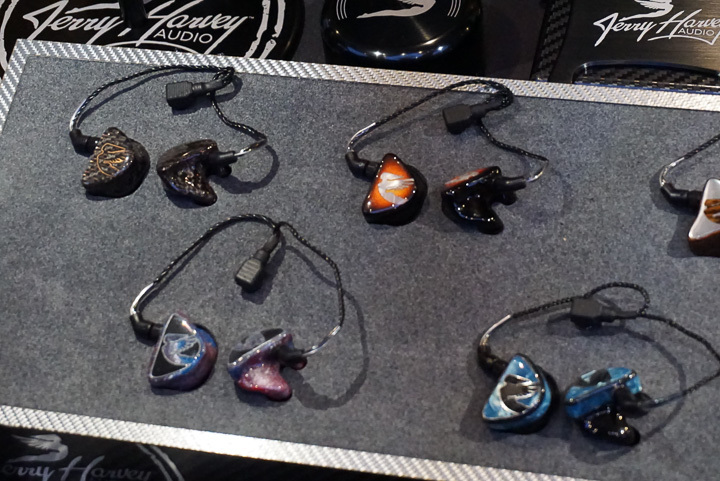 JH Audio did not have any new earphone of CIEM designs to show at CanJam NYC, but what it did have were an extraordinary range of Signature Series custom finishes that can be ordered on any of the firm’s CIEMs. Finishes include Luthier (Bocote wood shell and logo with titanium faceplate, $1000), Mosaic (black shell and logo with light blue and white pearloid faceplate top and sides, $600), Spotlight Red (black shell with red pearloid faceplate and black pearloid logo with chrome trim, $525), Spotlight Blue (black shell with blue pearloid faceplate with black pearloid logo with chrome trim, $525), Galaxy (swirled colour shell and logo with black faceplate and chrome trim, $525), The Founder (black shell and logo with abalone faceplate and trim rings, $525), Copper top (black shell and faceplate with copper trim rings and logo outline trim, $525), The President (blue pearl shell with zebra wood faceplate and inlaid abalone logo, $375), Rose (rose gold shell with brushed copper faceplate and chrome trim, $375), and Sunburst (black shell with sunburst-colour wood faceplate, $325). As a matter of personal taste, I was very fond of the Sunburst treatment, whose appearance is highly reminiscent of vintage sunburst-colour Fender guitars. 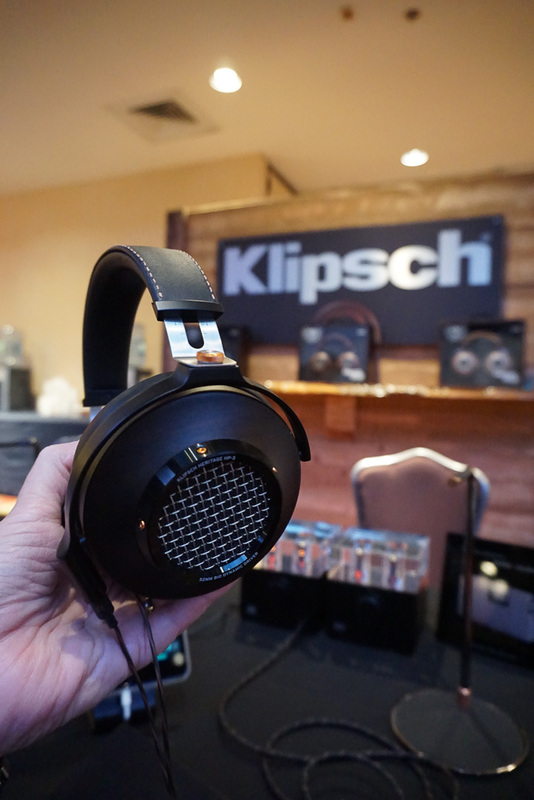 Klipsch has released to production its most ambitious full-size headphone to date: the Heritage HP-3 ($1,199), which is offered with the buyer’s choice of solid walnut, ebony, or oak ear cups. The HP-3 is a semi-open-back or “rear vented” design that features 52mm dynamic drivers fitted with “free-edge biodynamic” diaphragms and a magnet assembly delivering more that one tesla of magnetic flux density per ear cup. Not surprisingly, the HP-3 is very easy to drive with rated sensitivity of 98dB. Many would say the HP-3 mimics the sound of higher quality Klipsch loudspeakers, meaning that it offers a highly expressive and dynamic sound with powerful bass and just a hint of emphasis in the ‘presence’ region, which serves to enhance the perceived clarity and articulacy of the headphone. The headphone features sheepskin-covered ear pads and a cowhide headband pad/cover; apparent build quality is very, very high. 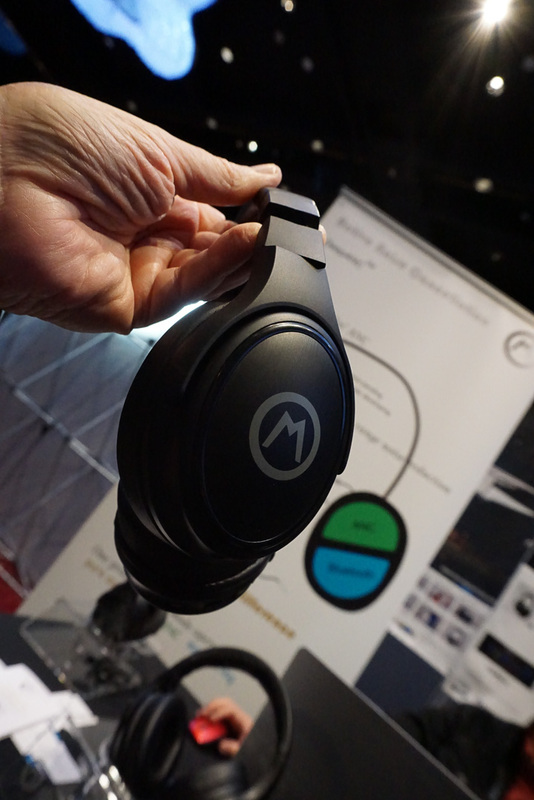 The San Jose, California-based firm M&O Electronics is a headphone technology development company with one product, called the MOOH-BE00BT Beryllium Acoustic headphone ($129), in completed form and another called the Deep ANC (projected price ~$200) under development. In simple terms the MOOH-BE00BT Beryllium Acoustic is an affordably priced, but also very high-tech aptX Bluetooth-capable headphone that is fitted with dynamic drivers using Beryllium diaphragms. For travel convenience, the Beryllium Acoustic headphone features ear cups that can fold flat, plus a useful range of accessory cables and a hard shell carrying case. It’s an uncommonly sophisticated design for its price class.